I wanted to blog about Eugene’s Stitch and Pitch Event today. But when I went to take a picture of my commemorative stitch marker, after the bunnies went to sleep last night, I couldn’t find it. I’m pretty confident the bunnies know where it is, so I’ll save that post and show you the sweater I “finished” right before the Stitch and Pitch, thinking I’d wear it to the event. A few years ago I used some birthday $$ to buy enough KnitPicks Sierra to make a lovely red Blackberry. Somehow it never got knit. When I stumbled upon the Shalom Cardigan while poking around on Ravelry last month, I remembered the yarn and dove into my stash. It knit up quickly and beautifully. I finished it the day before Stitch and Pitch. It was cloudy that day and I was hopeful that it wouldn’t be too hot to wear it to the baseball game the next evening. I washed it in Eucalan, laid it out to block in the spare bedroom, and went on about my business. When I was ready to get dressed for the game, I went to get the sweater and was shocked to find it was still quite damp. The sun was out but I didn’t have enough time to move it outside and let it dry before the game. Here is where I should have sucked it up, moved it outside, thrown on a sweatshirt and jumped in my car. Instead I thought “hey I’ve got a fancy schmancy new dryer, it was a godsend last fall when Mr. Slippers’ cobblestone was still damp after 3 days of laying out in the spare room”. So I tossed her in, set the dryer to “Ultra Delicate, air only (no heat) for 15 minutes” and went to brush my hair. Thank goodness I didn’t put it in for 30 minutes! When I opened the dryer, my beautiful cardigan had already started to felt. It wasn’t too bad, but not too good either. I tried it on… still damp, still fit, whew. I cut my losses there… didn’t wear it to the game, but brought it and asked all my fellow knitters whether I should keep it and work the fuzzy, felty look of it or just turn it into a cat bed. 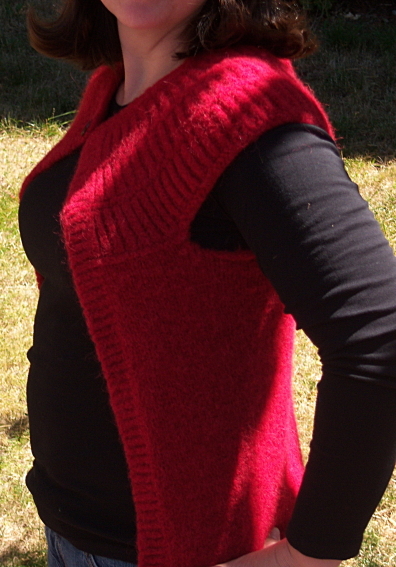 They all agreed the cardi works, now that it’s dry, I have to agree… but I think I’ll knit another one this fall and let it air dry… even if it takes a month! This weekend we had a nice taste of early fall weather. Cool and crisp in the morning and evening and gorgeously sunny and warm during the day. I took advantage and had Mr. Slippers take some pictures of the sweaters I’ve recently finished. I’ll share them all this week. Today, let’s catch up though, here’s what the gorgeous Juno looks like on. I just adore this sweater. Around here there are always several knitting projects being worked simultaneously. I’m usually working a large project after the bunnies go to sleep and one or two (or four) small things during the day. A hat that sits on the kitchen counter gets a round while I check my email, a scarf in my purse gets some action at the park, etc etc. 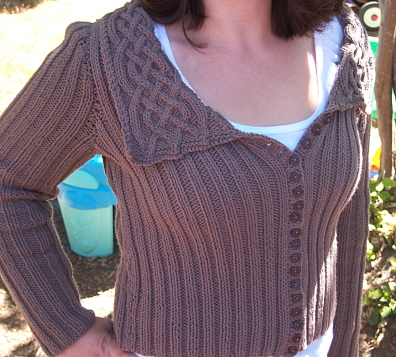 This little number is Shadkitty’s Buggerloo , worked in Paton’s Classic Merino. It took a few days of randomly knitting here and there. Little bunny LOOOVVES it. She suggests wearing it backwards and accessorizing with a feather boa (those little white flecks in the picture are fuzz from hers). 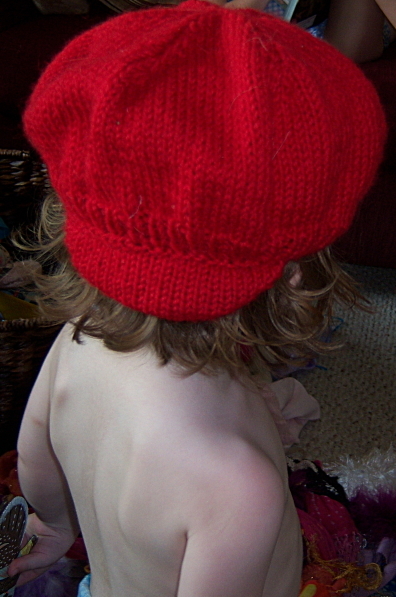 It’s one of a few winter hats’ I’ve finished this summer, anticipating the first really cold day this fall and promising myself to actually have something warm for my kids to wear (instead of, you know, trying to knit a couple of hats really fast that morning). Now I’ll work on posting pictures of them here before that cold weather hits! You are currently browsing the Bunny Slippers blog archives for August, 2008.